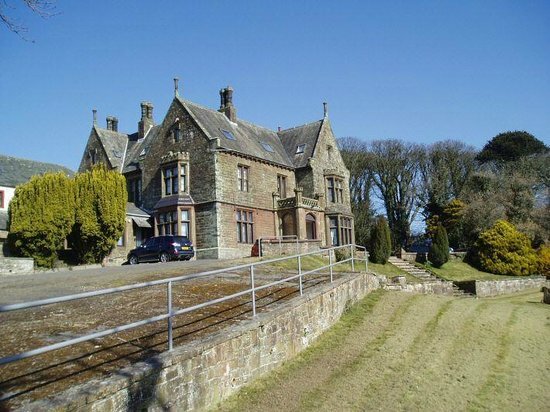 It was typical of many Victorian manor houses and stood within 3 acres overlooking the rolling countryside to the west of Maryport. It was built with stone mullioned windows, decorative fireplaces, a cellar and elaborate wood-workings. An entrance portico leads into the entrance hall and various reception rooms. 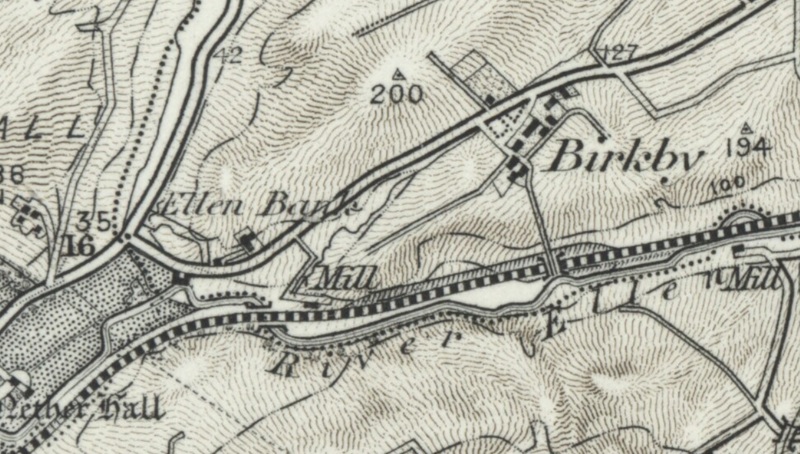 The house was originally known as Ellen Bank but became known as Ellenbank in more recent years. 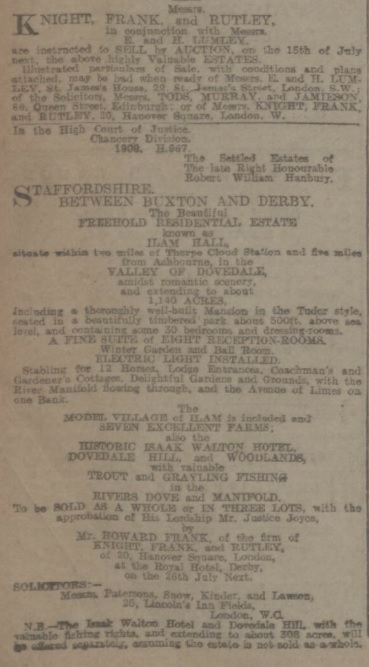 In addition to Ellen Bank Ritson owned land and cottages at Allerby, Aspatria, Byerstead Southerfield and Bromfield as well as land at Toxteth Park in Liverpool. He married Mary Anne Smith in 1842 and lived at 122 High Street, in Maryport. They had four sons, the oldest being John Ritson (1848-1897), and four daughters. By 1852 the Ritson family had moved to Ellen Bank and employed a cook and two housemaids. However, with increasing wealth, they had obtained the services of a groom, John Bainbridge, by 1871. John Ritson (1848-1897) inherited the mansion house at Ellen Bank as well as the farmland and cottages at Allerby and Aspatria. 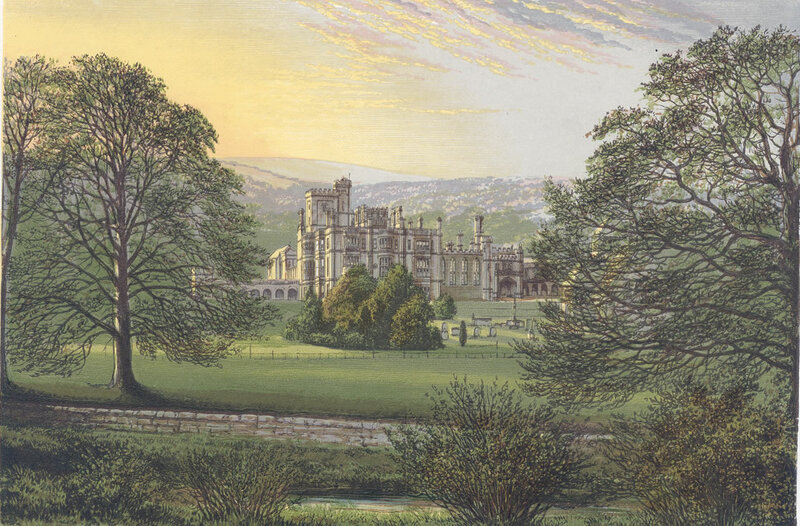 He also acquired the land at Toxteth Park which was under contract for sale to Mr Hugh Jones. In early life John Ritson was an officer in the Cumberland Militia. He then took an active part in the management of the family business and gained a reputation as ‘a man of sterling character’. He was also a director of the Maryport and Carlisle Railway, the West Cumberland Iron and Steel Company and the Cumberland Union Bank. He was also a J.P. for Cumberland. In 1865 John Ritson married Mary Jane Logan, the daughter of Captain John Logan, of Maryport, at St Luke’s Parish Church in Chelsea. Between them they had two sons, Robert and John, and two daughters, Marjory and Kathleen. In 1891 they employed three servants as well as a governess to take charge of the children. John Ritson died suddenly in 1897 aged 50. He had suffered heart problems for a while but this didn’t deter him from being an enthusiastic cyclist, one of his greatest passions. On Monday 13 September 1897 he had spent the day shooting partridges with his two sons at Allonby. 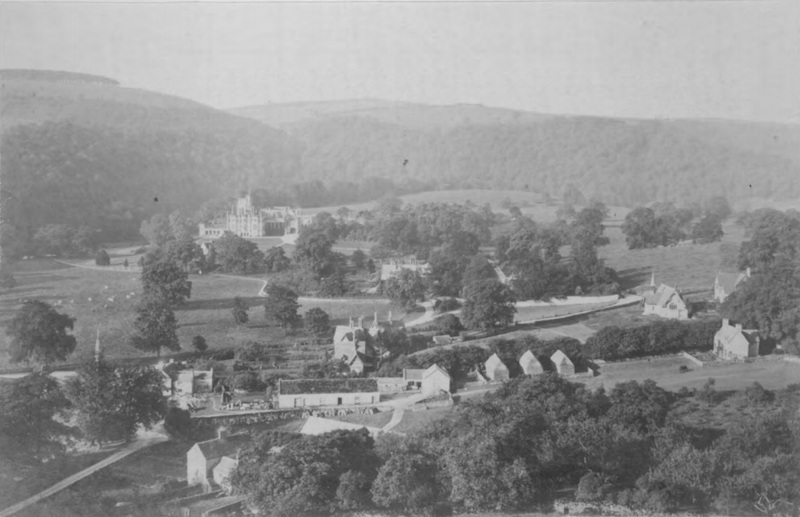 In the evening he took the train from Bullgill to Cockermouth and cycled with Mr W.B. Mathias to Keswick, where his wife and family had been staying. He then cycled back to Maryport the same night. 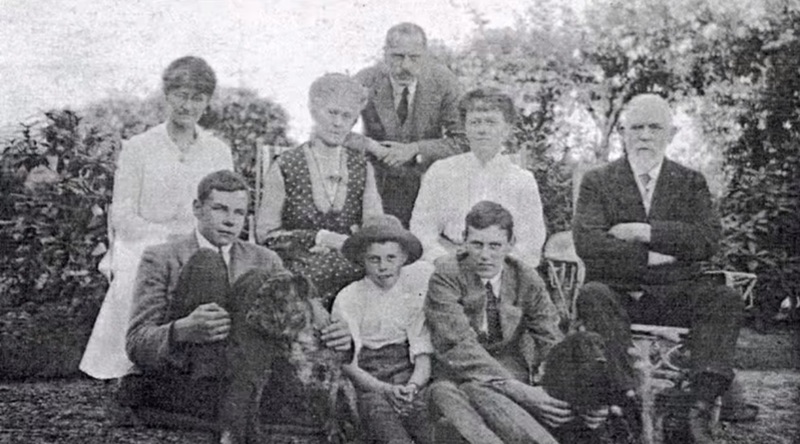 At the time of his death his eldest son, Robert, was just 9-years-old. His widow remained at Ellen Bank until her death in 1939 and the house remained in the family until the 1980s. 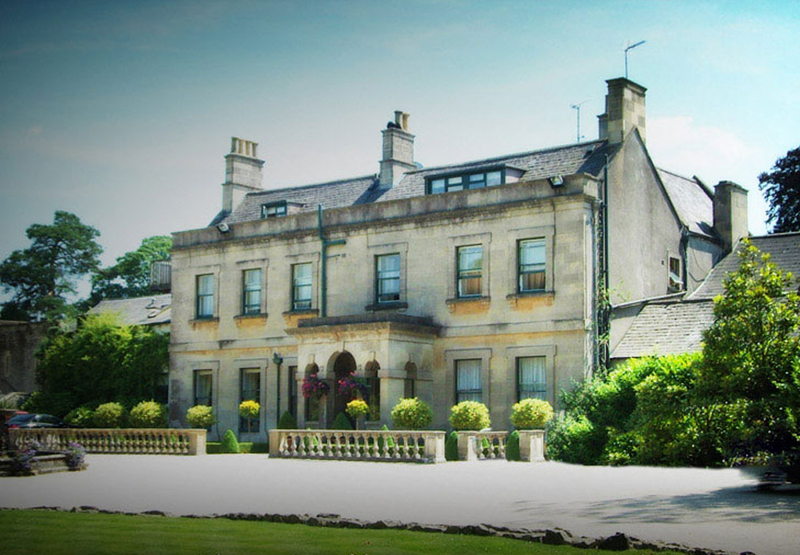 The house was purchased by the Mitchell family in 1985 who turned the house into a country house hotel. 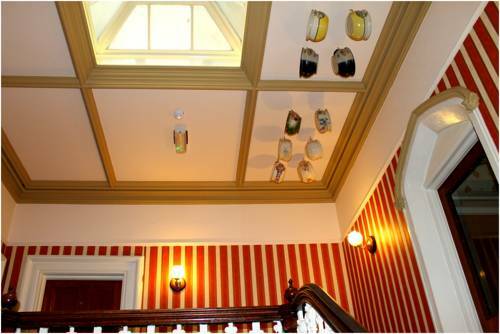 It was subsequently converted and extended resulting in 26 en-suite guest bedrooms and a function room. 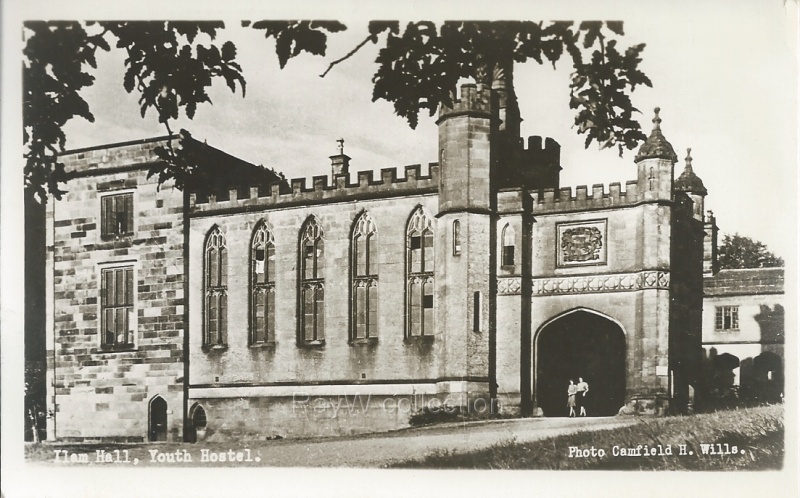 It became popular as a country hotel and became a meeting place for organists from all over Cumbria who played there on a regular basis. 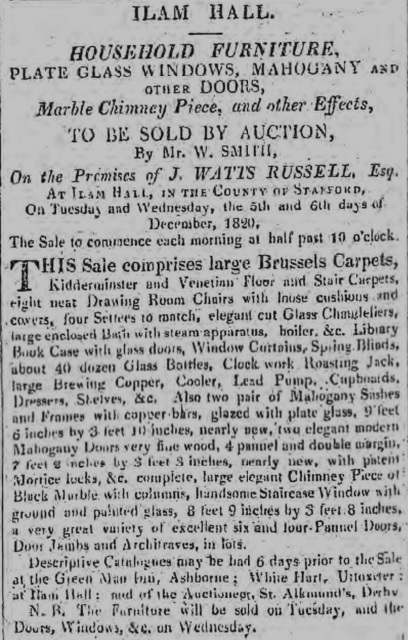 When the Mitchell’s decided to retire the property was placed on the open market. However, like similar size Victorian properties, the cost of renovation looks to have discouraged potential purchasers. †There is a possibility that the house may have been built by Joseph Ritson, his father, who died in 1865. 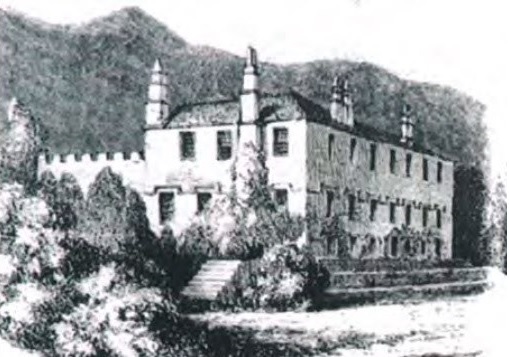 In March 1866 the Carlisle Patriot carried an advertisement for ‘ a desirable dwelling house, known as Ellen Bank, near Aspatria’. It contained 4 sitting rooms, 6 bedrooms, dressing room, pantry, cellar, good kitchen, carriage house and two-stalled stable. With views over the River Ellen it was described as being ‘very substantial, well-fitted, having been built about 10 years ago by the late proprietor for his own occupation’. 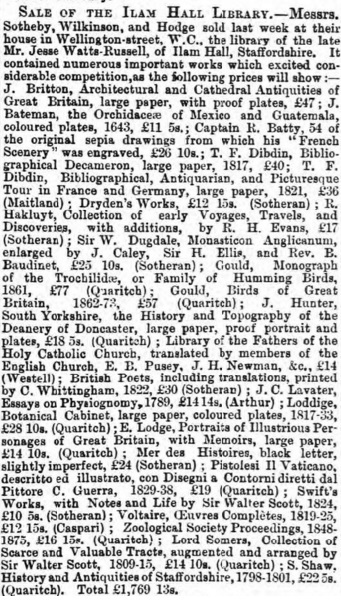 This may be Ellen Bank of this article and may refer to Joseph Ritson who died the previous year. 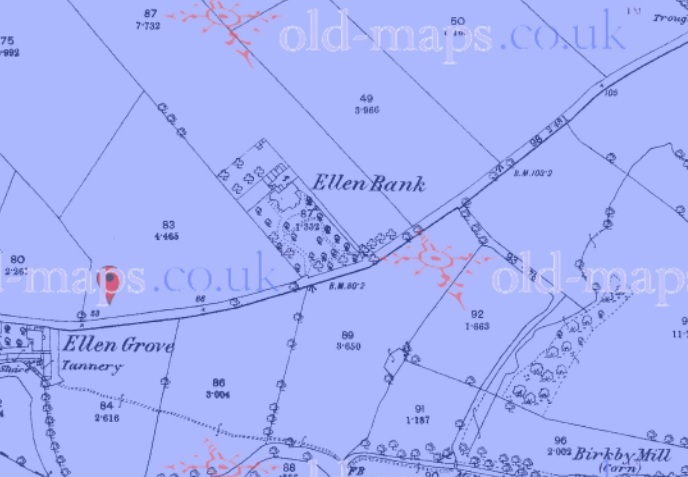 However, we must regard this with caution as there might well have been a similar dwelling called Ellen Bank at Aspatria. 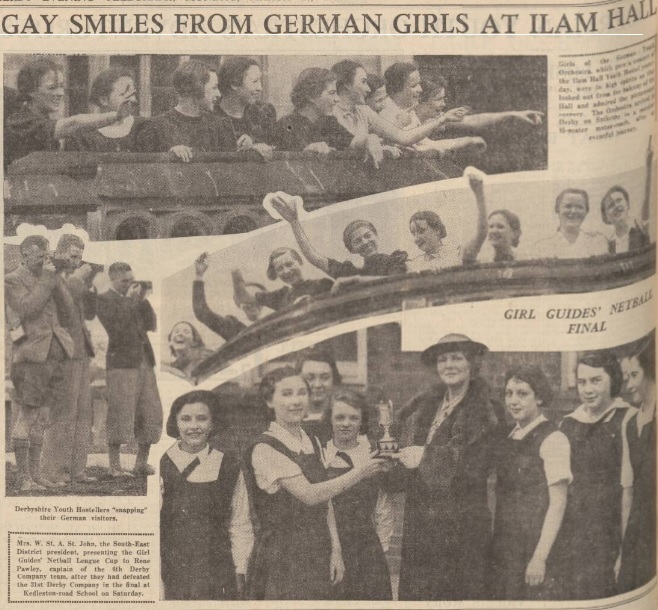 The subject of this article is much nearer Maryport. Maryport quickly developed as an industrial centre throughout the 19th century. 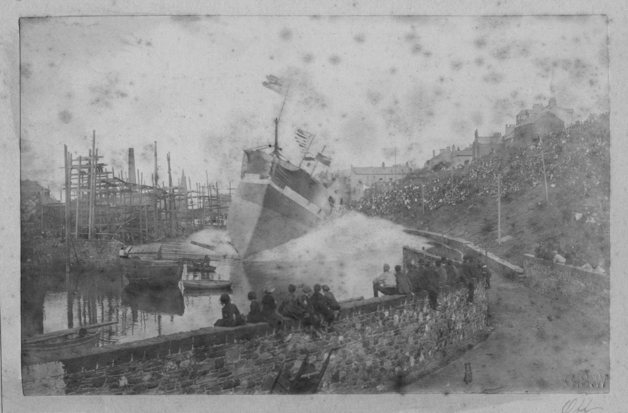 An iron foundry opened and the port developed as did shipyards, such as Wood’s yard and Ritson’s yard, which was famous for launching ships broadside into the River Ellen because it was not wide enough to allow ships to be launched the usual way. Ritson’s operated until 1914. 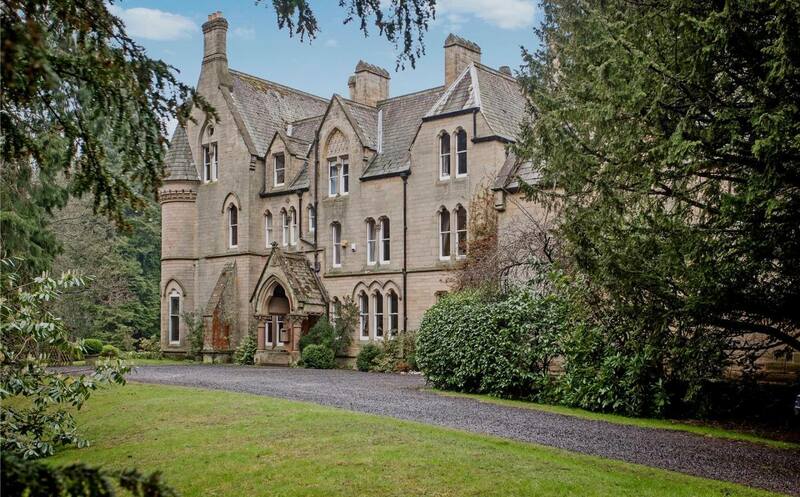 Shotley Hall, near Consett, County Durham, was designed and built in 1863 by renowned architect Edward Robson, an associate of both John Dobson and Sir George Gilbert Scott, for Thomas Wilson (1800-1880), local magistrate and Deputy Lieutenant for Cumberland. 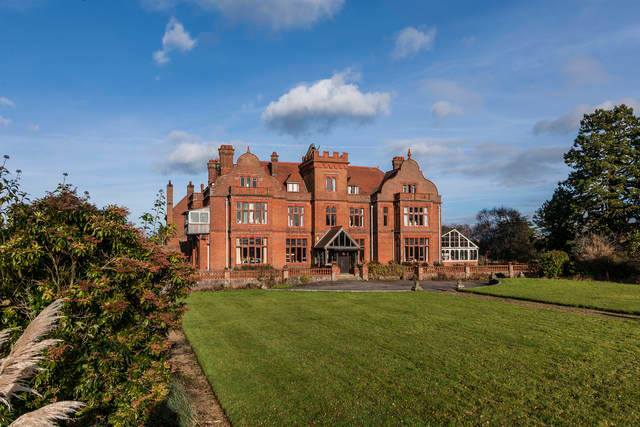 The Hall’s beautiful High Victorian neo Gothic design and solid but romantic style fulfilled the aspirations of the wealthy owner. The family originally came from Nent Head and made their fortune in the lead mining industry. They arrived in 1830 when there was already an extant Queen Anne house. Because they had the money they decided to replace it with this ‘muscular gothic’ design. 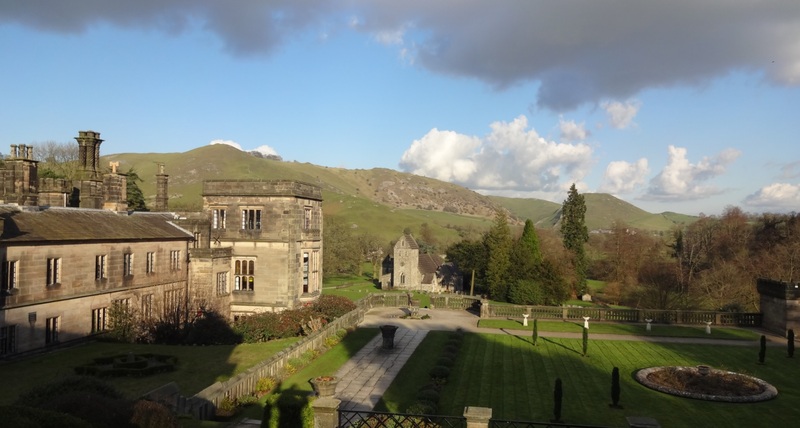 It was built in dressed sandstone with ashlar dressings, a graduating lakeland slate roof and stone chimneys. Historic England call it ‘playful Gothic style’. Shotley Hall’s importance in British architecture is emphasised by the outstanding works of William Morris, with his pieces and inspiration prevalent throughout the property. 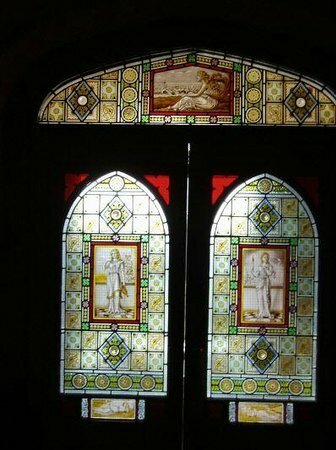 William Morris’ influence in Shotley Hall is clearly present; from the ten stained glass windows, the brass fireplace surrounds, the unique tile roundels set into the dining room fireplace to the main hall staircase wrought iron balustrading. It has been lived in throughout by members of the same family who built it and is Grade II* listed. In 2016 it was offered for sale with Savills at a guide price of £1,350,000. 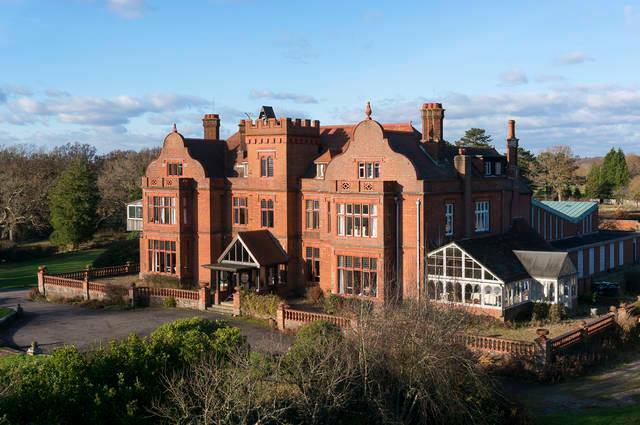 Foxhunt Manor at Waldron in East Sussex is a magnificent manor house dating from 1898 and built by Joseph Lucas J.P., a builder who designed and built the property for himself and his family. In context of most country houses it is not necessarily beautiful. Its appearance is very Victorian but not necessarily for the better. The house has a foreboding look of ‘institution’ about it and could have been built as a public building. 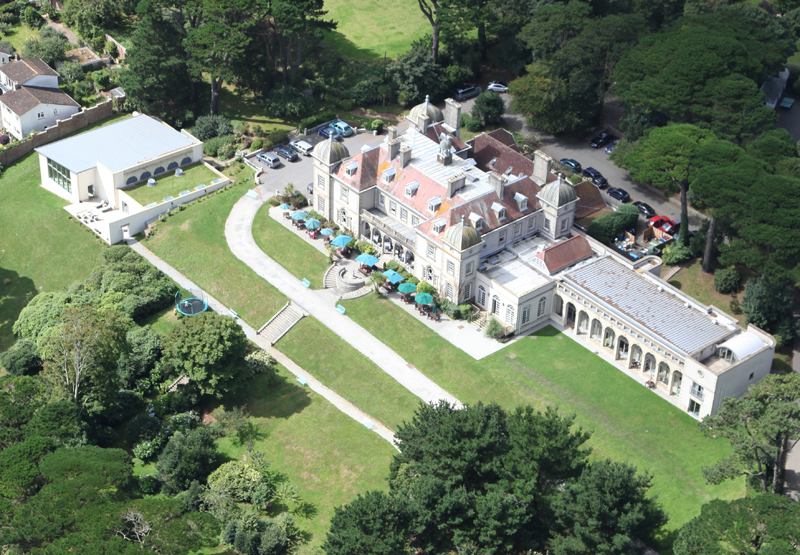 Joseph Lucas sold Foxhunt Manor in 1920 and moved to Birkdale, Branksome Park, Bournemouth. The house was sold to Eugene Fitzroy Oakshott in 1920 who remained until his death in 1934. Eugene Fitzroy Oakshott was the son of Eugene Phillip Oakshott who had made his money building up the department store, Spencer and Co of Madras, in India. Following Eugene Fitzroy Oakshott’s death the house and estate were offered at auction by Knight, Frank and Rutley in 1935. 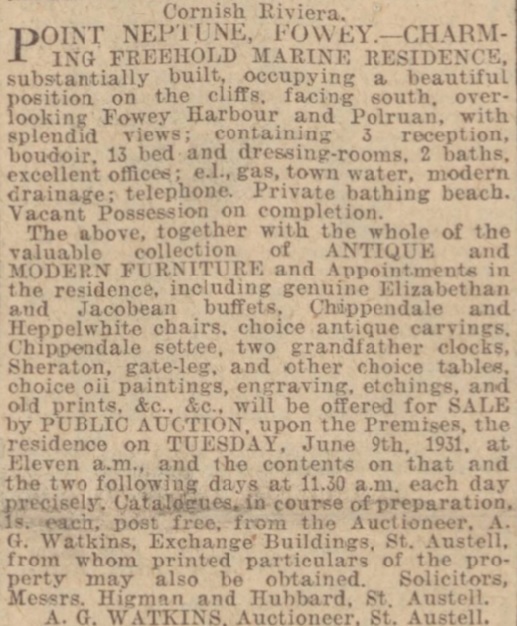 Auction notices at the time described Foxhunt Manor as standing high and having magnificent views to the South Downs. It was a ‘modern’ house with 2 halls, 3 reception rooms, a billiard room, 17 bed and dressing rooms, 4 bathrooms and several offices. It offered an ample private water supply, electric light and central heating. Its pleasure grounds came with tennis courts, bowling green and a ‘prolific’ orchard. 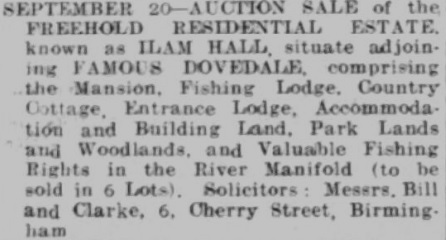 The house and estate failed to sell but sold privately to the Xaverian Brothers in December 1935. It was run as a preparatory boarding school for Mayfield College (then known as the School of St. Edward the Confessor). The school closed in 1959 when it was purchased by the Order of The Visitation and used as a Monastery for the Visitation. The religious order recently moved to stables on the original estate and Foxhunt Manor put up for sale. The house has brick elevations with matching coloured mullions, under a tiled roof. It is uncertain how much of the original interior remains but the joinery is high quality oak with panelled dados and doors, carved friezes and chimney pieces, fine carved archways and wood panelled ceilings to some rooms, with oak strip floors. 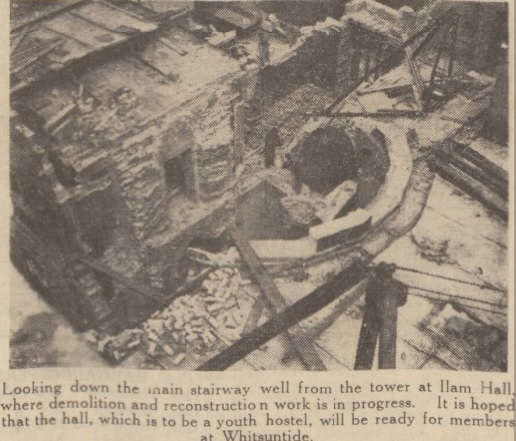 The current accommodation is arranged over 4 floors and an architect has drawn up proposals to create a reception hall, library, drawing room, conservatory, dining room, music room, kitchen, scullery and morning room on the ground floor; a master bedroom suite and 6 further first floor bedrooms; extensive staff accommodation on the second floor; and gymnasium and service areas on the lower ground floor. In the 1960’s a substantial addition was built housing a chapel and ancillary rooms. Fowey is fêted for long-established families. In Victorian times the names of Hanson, Rashleigh and Treffry were uppermost in the growth of this picturesque little Cornish town. Their names still evoke pride amongst the locals who realise that, without their intervention, the town’s present day prosperity might never have happened. The Treffry family are still resident at Place, a wonderful house, hidden within Fowey’s narrow streets and a stone’s throw from the harbour. The Rashleigh’s have retreated to Menabilly, a country house now more famous as being the former home of Daphne Du Maurier. However, the Hanson family have gone but can take pleasure that they are not forgotten. 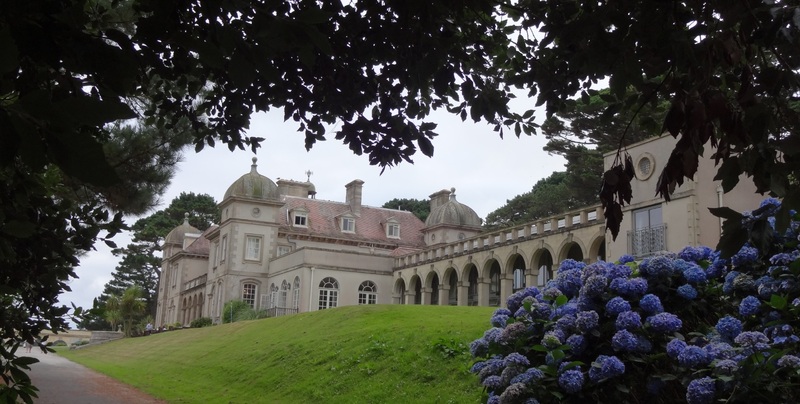 Fowey Hall is a lasting reminder to one of the town’s most famous sons. It echoes the story of a young boy who left Fowey to make his fortune. He travelled afar and returned home an extremely wealthy man. His legacy is Fowey Hall, one of the last country houses to be built in England, and constructed with such grandeur that suggests it was built in earlier times. 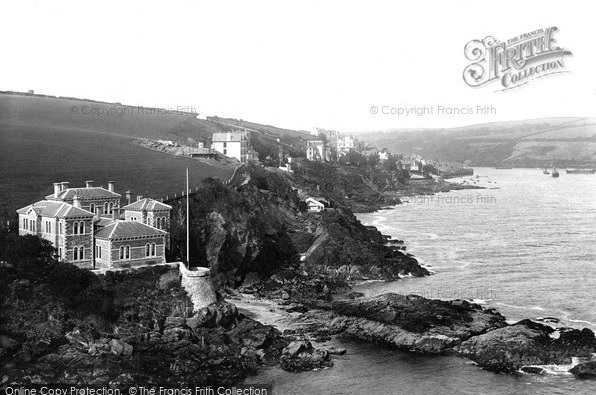 Our story starts in 1889 when the businessman Charles Hanson looked to build a new house in his beloved Fowey. He found a plot of land in a commanding position with fine views of the harbour. The land was owned by the Rashleigh family and overlooked Place, the ancestral home of the influential Treffry family, and no doubt cost Hanson a lot of money to buy. It would be another ten years before the house was completed. According to deeds the land was far more extensive than the grounds which exist today and it is likely that much of this was sold off in later years. Charles Augustin Hanson was born in Polruan, across the river from Fowey, in 1846. 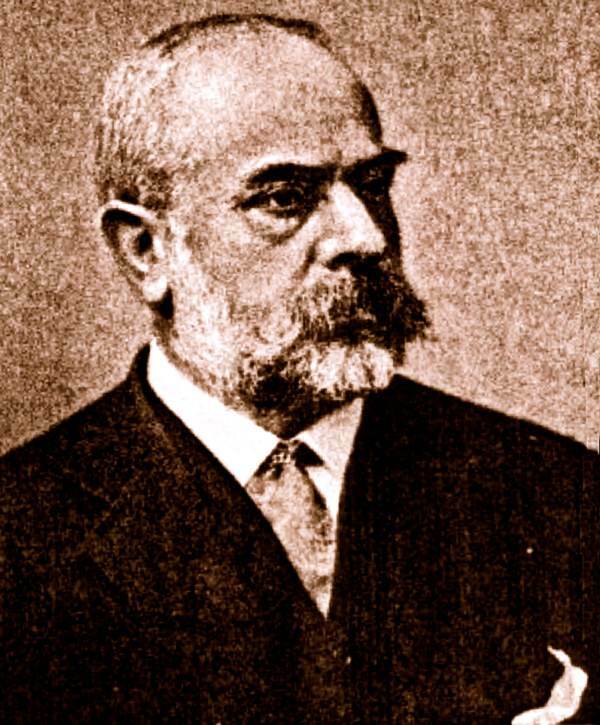 He was the eldest of five children of Mr Joseph M.A. Hanson, a master mariner, and Mary Ann Rogers Hicks who lived at St Catherine’s Street in Polruan. 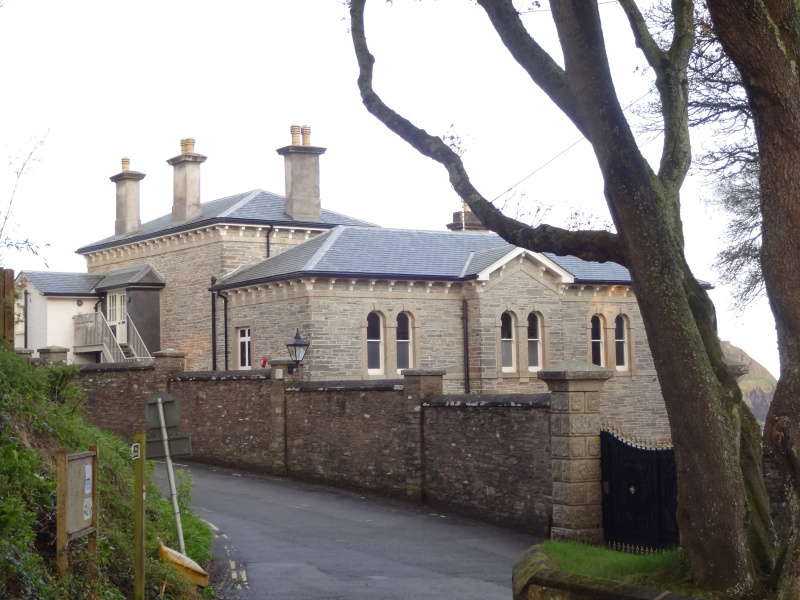 The family moved to Fore Street in Fowey and Charles completed his education at Fowey Grammar School. He nurtured ambitions to work in finance and, on leaving school, worked as an assurance office clerk in Plymouth. He stayed for two years or three years before moving to Canada. It would appear that his parents also made this perilous journey across the Atlantic. In Canada he initially worked in the lumber trade before entering the finance markets. He was joined by two brothers and became stockbrokers in utility investment. Hanson Brothers Montreal eventually became one of the largest firms of private bankers in Canada. 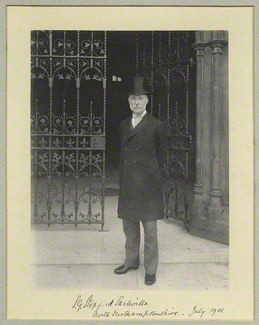 Charles Hanson was a pioneer in introducing Canadian Government, municipal and railway securities to the London market, and one noteworthy result of his many trips back to England was his entry into partnership with Messrs. Coates, Son and Co, of Gresham Street, London, and the Stock Exchange. In 1868 Hanson married Martha Sabina Appelbe (1849-1924) of Trafalgar, Halton, in Canada. 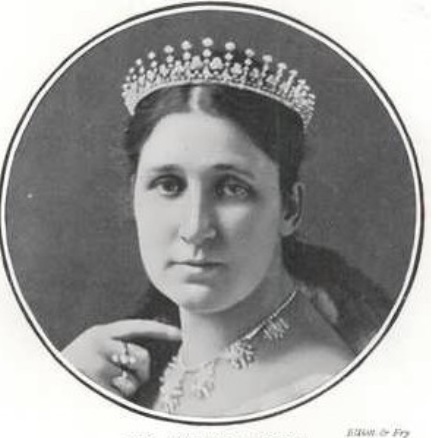 She was a wealthy heiress and they would have one son, Charles Edwin Bourne Hanson, and a daughter, Alice Maud Appelbe Hanson, both born in Ontario. He remained in Canada for 22 years and was a member of the Wesleyan Ministry. His business interests were identified with Canada and Newfoundland, but he increasingly controlled his financial undertakings in London. On the rare occasions when he was released from business pressures he often returned to Fowey. 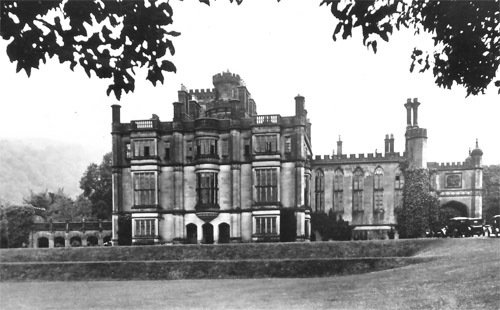 Hanson returned to London in the late 1880’s and gave the go ahead to build Fowey Hall. At the close of the century he was living at 9 Wilton Crescent, in Belgravia Square. 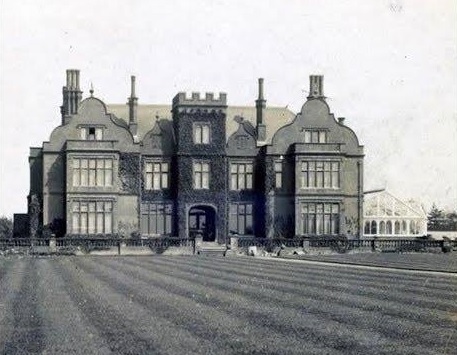 By 1899 Fowey Hall was ready to receive its roof and shortly after he moved in with his wife. The Royal Cornwall Gazette described it as ‘a fine mansion looking from the harbour’. Today the date is inscribed on drain pipe headings around the property. 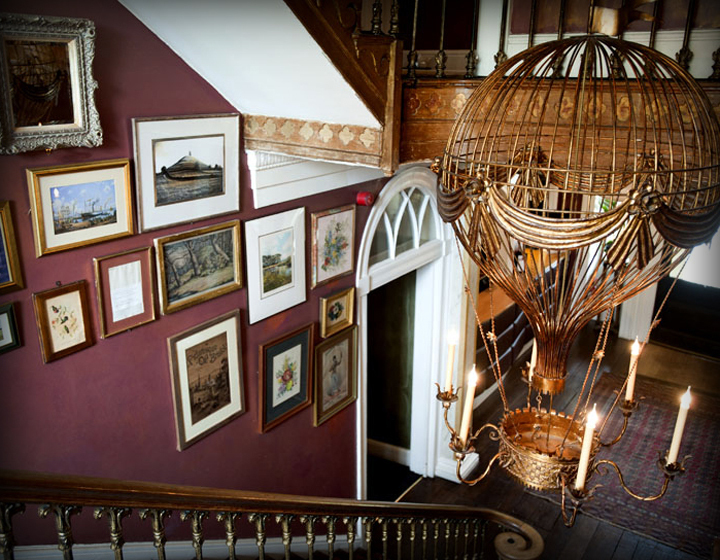 Fowey Hall was extremely grand, built of the finest materials by master craftsmen. It boasted electric lights, Baroque plasterwork, a vaulted kitchen, elaborate marble fireplaces and warm air central heating. According to records the main painting in the dining room was by Canaletto and is now displayed at the Walpole Gallery in London. The house was bedecked throughout with wooden panelling, much of which still exists to this day. The road leading to the house was specially constructed and known as the Ropewalk. It still exists and has been renamed Hanson Drive. 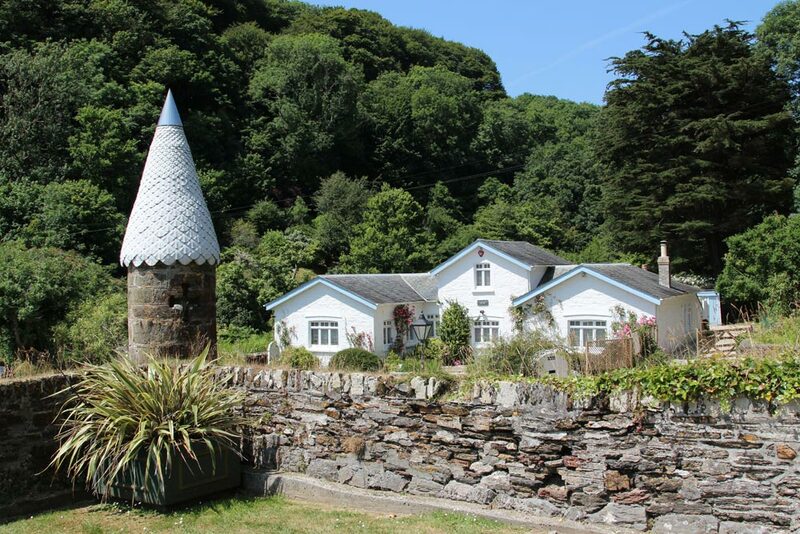 In the grounds of Fowey Hall stood an ancient windmill which had originally been built in 1290. The tower was dilapidated and in danger of falling down but Hanson paid a considerable fortune to have it restored and strengthened. His return to England heralded the golden period for Charles Hanson. He became a Justice of the Peace in 1904 and was High Sheriff of Cornwall in 1907. His business activities also included the chairmanship of the Gresham Life Assurance Society and the Gresham Fire Insurance Society, the latter formed under his guidance. He was also interested in the China Clay Corporation Ltd which carried out activities at Redlake, near Ivybridge, and of which he was chairman. 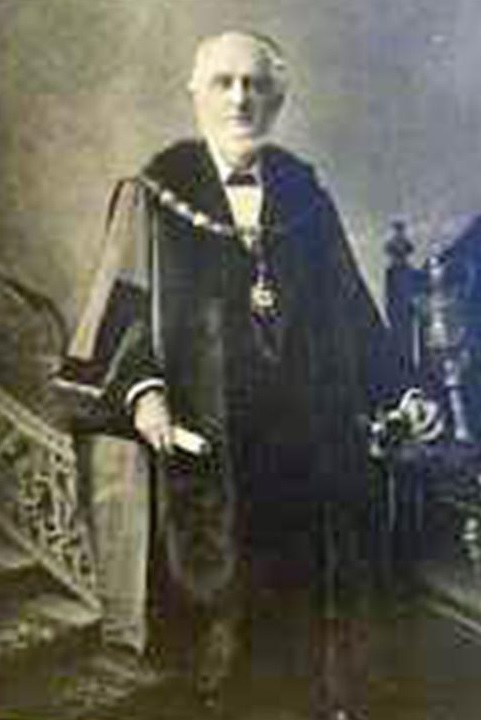 Hanson found time to serve the corporate life of the City of London, becoming an Alderman in 1909 and Sheriff in 1911-12. He was also one of the representatives of the City on the London County Council. 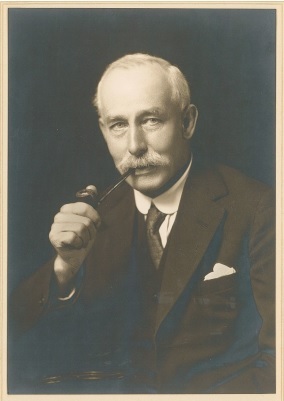 In 1916 Hanson won Bodmin for the Conservative Party where he served as M.P. until his death. His introduction into Parliament rejuvenated the 70-year-old although he was never to raise his voice in the House of Commons. Observers noted that Hanson was more interested in other people’s talks rather than his own conversation. In 1917-18 he became Lord Mayor of London and was given a Baronetcy in the latter year. While in office he was awarded a gold chain and badge of office, the chain bearing ornamental shields upon which were enamelled the arms of the Worshipful Company of pattern-makers (of which he was master on three occasions), and also those of Cornwall, Canada, Newfoundland, and Fowey, with a view to the entrance to the Stock Exchange, while in the centre of the badge were Sir Charles’ arms, crest and motto. (This was presented to Fowey in 1921 and is today on display at the Fowey Museum). His services to the county were highlighted when he was awarded the Freedom of the Borough of Liskeard in 1919. Hanson travelled considerably and visited practically every part of Europe, as well as most of the British colonies. In 1908 the Emperor of Austria conferred upon him the Knight’s Cross of the Order of Franz Josef, with permission to wear the decoration being granted by King Edward VII. He was also a Knight Commander of the Grecian Order of the Saviour, a Commander of the French Legion of Honour, a Grand Officer of the Crown of Italy, and possessed the Japanese Order of the Rising Sun, third class honours conferred upon him by the heads of the Allied nations in recognition of his valuable work on behalf of the nation and the Allied cause during the First World War. While he might have been highly regarded in business and political circles it was not the case with members of the suffragette movement. Presumably his views were more traditional and, in the early 1900’s, his beloved Rolls-Royce was set on fire by protestors while parked in the coach house at Fowey Hall. 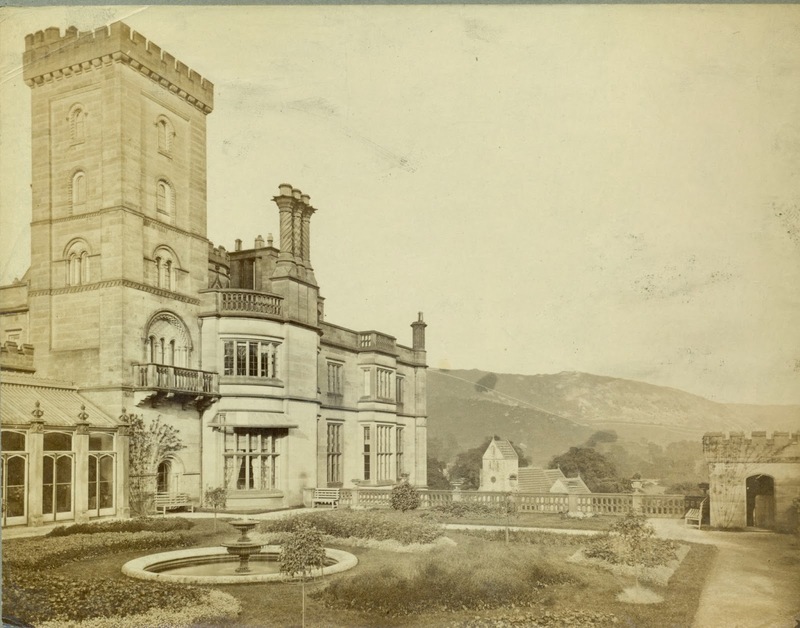 ‘As a suitable backdrop from which to promote his political career, by the time it was completed, Fowey Hall was truly a place in which to welcome royalty who visited during the early part of the century – although perhaps not as regularly as Charles Hanson would have liked! We have inherited correspondence which includes a wealth of telegrams from Sir Charles to members of the Royal Family at Sandringham, Buckingham Palace and Marlborough House – all of them extravagantly worded invitations which place Fowey Hall at the disposal of King Edward and Queen Alexandra and latterly, the Princess Victoria. Members of the Royal household may have wished that Sir Charles had been rather less assiduous in his attentions as each invitation necessitated an elegantly worded refusal. Throughout the early part of the century, Sir Charles kept the post office busy with a constant stream of telegrams to the Royal Family, needing only the slightest rumor of a Royal indisposition or news of an anniversary to renew his attentions’. 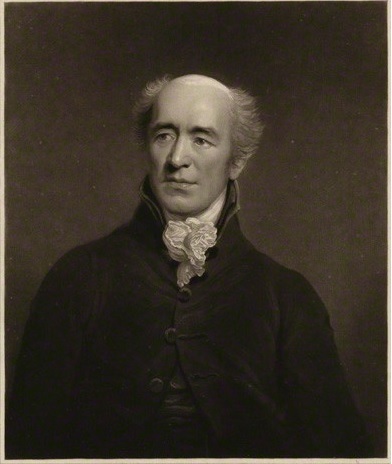 Sir Charles associated himself with many charitable enterprises and was on the governing bodies of several charities including Christchurch, Bridewell and St Thomas. Even when Fowey Hall was unfinished he used the grounds to host a hospital bazaar, raising funds for a new cottage hospital. ‘A charming spot commanding magnificent views of the picturesque harbour, and the blue waters of the English Channel beyond,’ said a local newspaper. ‘The bazaar was held in a large tent, and the grounds were gaily decorated with strings of flags’. In 1916 Hanson held a fundraising event in aid of the Great War at Fowey Hall. Postcards celebrating the event were sold in Fowey for months afterwards and the dining room was used as a sewing room, used by the ladies of the town, who created garments for the soldiers. By 1921 Sir Charles Hanson was in failing health. His last public appearance was in November when he was made the first Freeman of Fowey. He died on 17th January 1922 at Fowey Hall. The funeral took place the following week and the town of Fowey descended into mourning. All shops and premises closed for the duration, flags on various public institutions and ships in the harbour and river were flown at half-mast all day. ‘It was a simple but impressive procession which wended its way through the narrow, silent streets of the old world town. First came members of the local lodge of Freemasons, and a few visiting brethren, wearing white armlets and sprigs of acacia. Then followed a lorry buried under a wealth of beautiful wreaths, and immediately behind was the hearse, containing the coffin shrouded in a Union Jack, on which rested a cushion bearing the deceased’s orders and decorations. 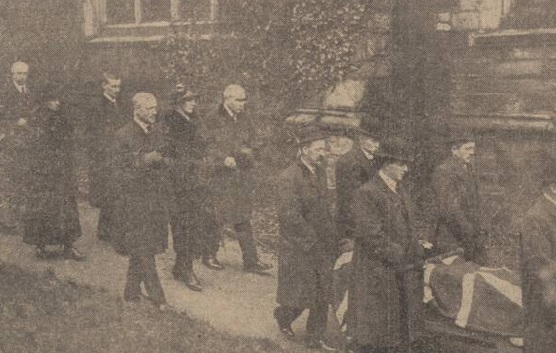 The immediate mourners were Major Sir Charles Edwin B. Hanson, deceased’s only son and heir, with his wife, and Major General Frederick Poole (son-in-law), Mr and Mrs H. Brent Crotrian and Mr and Mrs Appelbe (nephews and nieces) followed on foot, together with the Mayor – wearing in addition to his robe of office – the magnificent gold chain worn by Sir Charles during his year of office as Sheriff of London, and now the property of the Corporation of Fowey – aldermen and members of the council, borough officials, and mace bearers, the rear being brought up by members of the Cornwall County Constabulary, two of whom carried the ancient white staves emblematic of the arm of the law, to which were affixed black bows’. Sir Charles Hanson was buried in the little cemetary overlooking the old harbour. Following his death the three codicils of his will were Sir Charles Edwin Bourne Hanson, now of Fowey Hall, his son-in-law, Major-General Frederick Poole, of Cotswold House, Fowey, and Mr Herbert Brent Crotrian, Recorder of Scarborough, and residing at Leighton Buzzard. 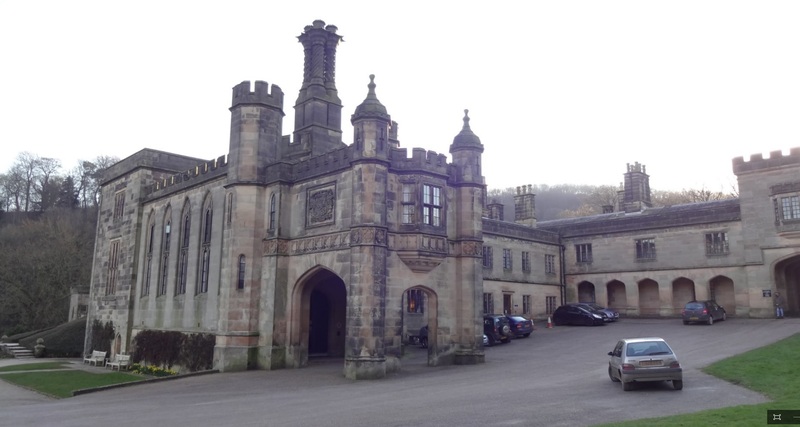 According to his will It was suggested that Charles Hanson had intended to bequeath certain legacies to members of his household staff at Fowey Hall, all of whom he had great regard. However, the impact of the First World War had been so severe that he regretted to find that he was not in a position to do as he had hoped. He left £2,000, his motor cars, and garden effects to his wife, certain jewellery to his son, household effects to the value of £5,000 and a reasonable selection of personal effects to his daughter, Dame Alice Maude Poole, and the residue of his belongings to his wife during widowhood. 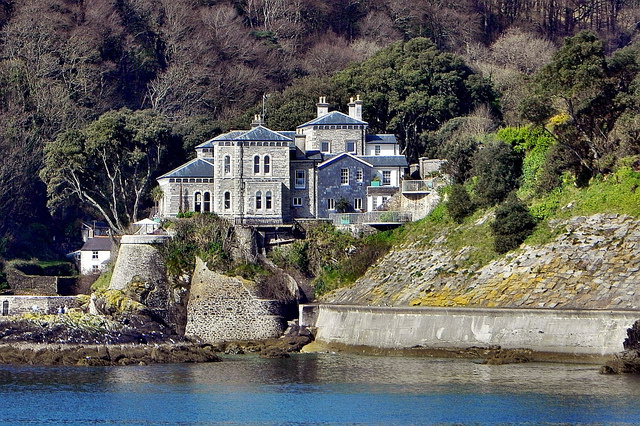 Fowey Hal was inherited by Sir Charles Bourne Hanson and the residue of his properties were shared between his two offspring. His wife, the Dowager Lady Hanson, died at Fowey Hall in 1924. She also suffered ill-health during her later years. Unlike her late husband she did not take a prominent part in public life although she was the inspiration which guided him. She preferred to take interest in poorer people and during World War One supported the Red Cross movement and received the Red Cross Medal for her efforts. Sir Charles Edwin Bourne Hanson, 2nd Bt, (1874-1958), followed his father into finance. He might not be as well remembered but nevertheless lived a busy and prosperous life. Hanson graduated from Clares College, Cambridge University, with a Master of Arts (M.A.). He became a military man gaining the rank of Captain with the 4th City of London Volunteers serving in the Boer War between 1899 and 1902. In June 1902 there was a large gathering at Fowey Railway Station for the return of Captain Hanson from South Africa. A carriage drawn by willing hands paraded through the streets, decorated with bunting, and headed by a brass band. The procession climbed the hill to Fowey Hall where refreshments were handed out to those taking part in the homecoming. He later served as Lieutenant for the 3rd Battalion of the Duke of Wellington’s West Riding Regiment and was promoted to Major in the Great War. Away from the battlefield he succeeded his father as a partner in Coates, Sons and Company and became a member of the London Stock Exchange. In 1908 he married Violet Sybil Johnstone (1881-1966), the third daughter of Mr J.B. Johnstone of Coombe Cottage, Coombe, and lived at The Manor House, Old Malden, in Surrey. In 1910 Hanson became Lord Lieutenant of the City of London. 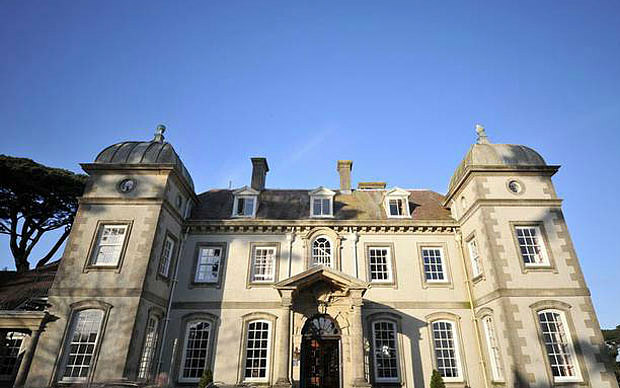 After his father’s death he moved into Fowey Hall while retaining his city residence at 14 Cranmer Court in London. He was appointed High Sheriff of Cornwall in 1939. 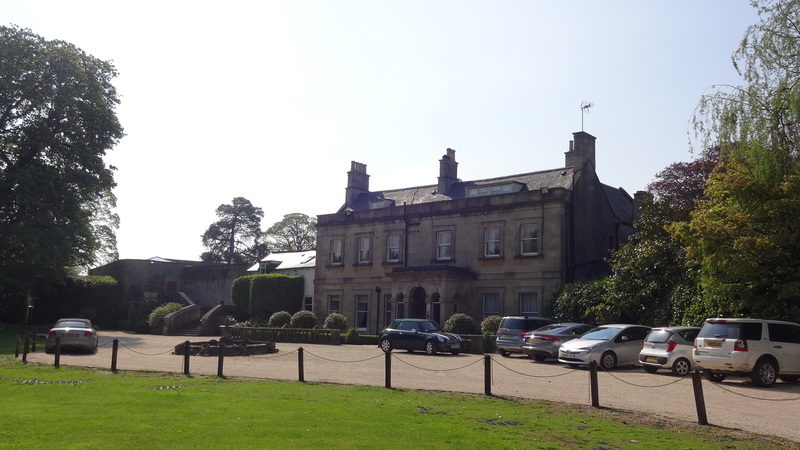 In 1940, a year after the start of World War Two, the War Office requisitioned Fowey Hall and, in 1943, it became a base for American officers. The Hanson family remained in residence for the duration of the war and watched as accommodation huts were built in the grounds (these would remain until 1946). 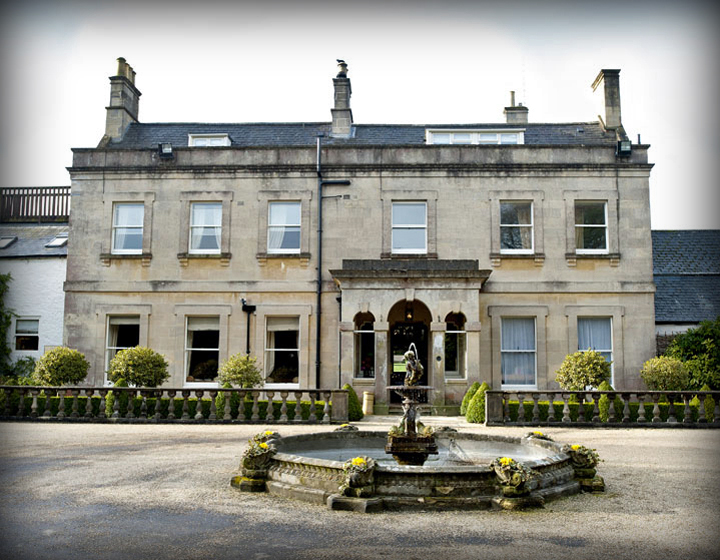 In April 1944 Rear Admiral Alan Kirk, Commander of the task force, and Rear Admiral John Wilkes, Commander of the landing craft, stayed at Fowey Hall in preparation for the massive D-Day landings of which many ships had amassed in Fowey Harbour. The following month forty war correspondents were accommodated at the hall and were briefed on forthcoming events. 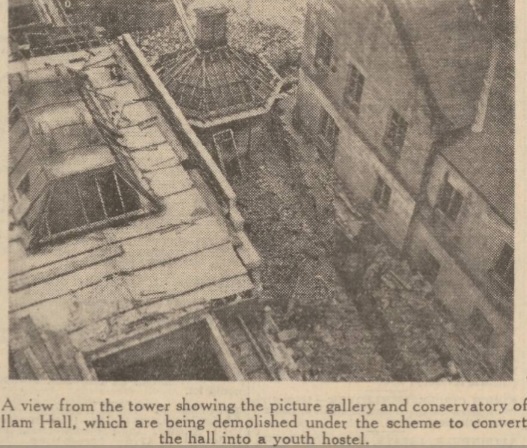 It is likely that the war had a devastating effect on Fowey Hall. Constant use and riotous officers’ parties probably damaged much of the interior. 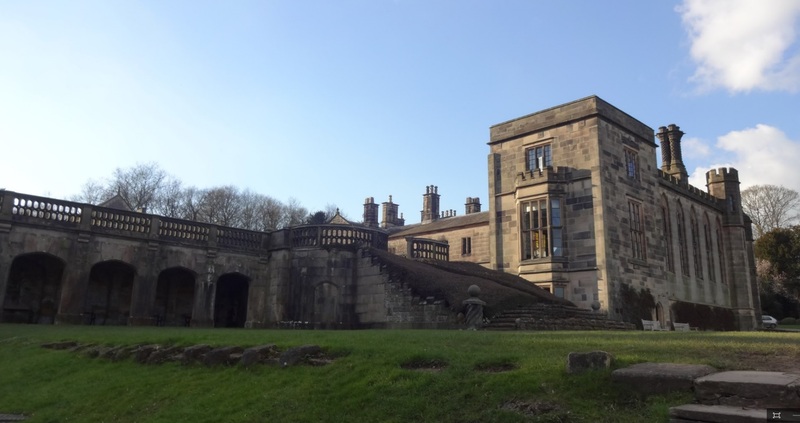 The Hanson family remained at the hall but it is likely that, after the death of Charles Edwin Bourne Hanson in 1958, the decision was made to finally sell. 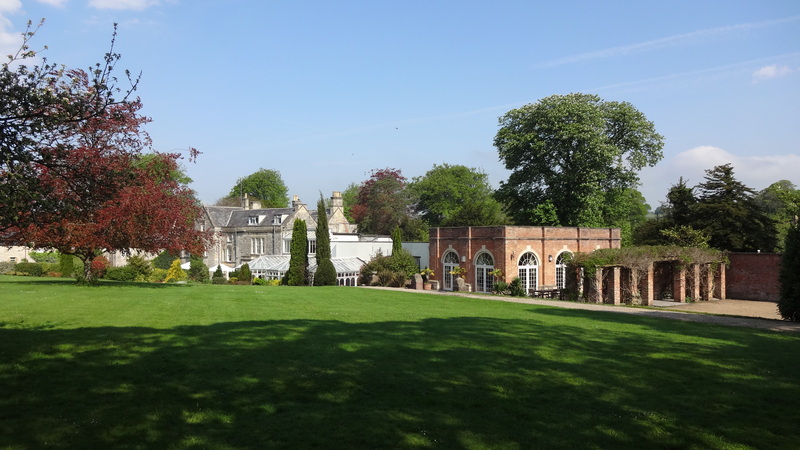 Much of the land was sold and it is thought that Fowey Hall was unloaded to a property developer who, in turn, sold it to the Co-operative Holidays Association. 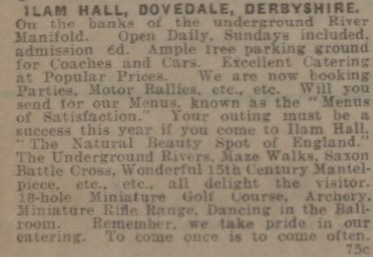 This organisation specialised in holidays for working class walkers, bird lovers and lovers of the countryside. 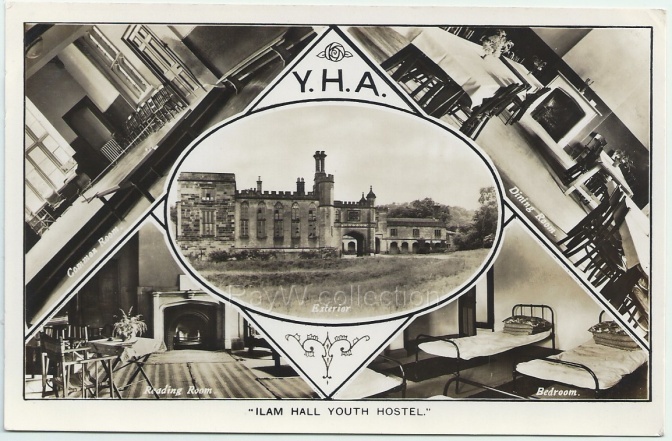 However, Fowey Hall was seen as offering more than the average hostel. The late 1950’s and 60’s had seen an unprecedented tourist boom. Increasing car ownership led to a growth in caravanning, independent and self-catering holidays. 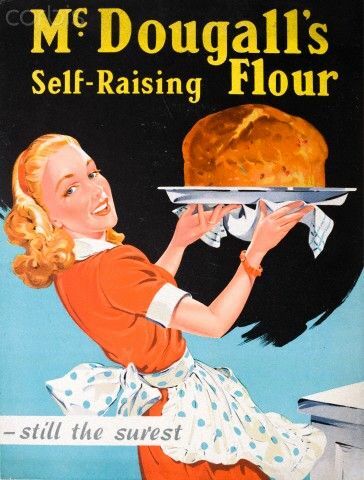 In an attempt to tap into this boom and attract a wider clientele, the CHA had decided to move away from the working class attachments of the co-operative movement, rebrand itself and broaden its holiday provision. (The official name of the Association was changed to Countrywide Holidays Association in 1964). 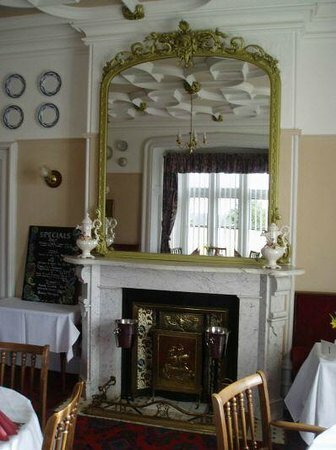 Fowey Hall was key to the CHA’s changing strategy but it meant that much of the interior was altered to accommodate holidaymakers. 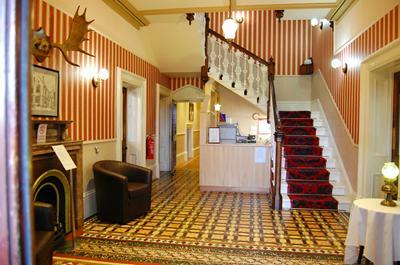 The bedroom floors were reconfigured with shower rooms at the end of the corridors although most of the ground floor remained in its original layout. By the early 1990’s the CHA was in decline and was keen to dispose of some of its properties. 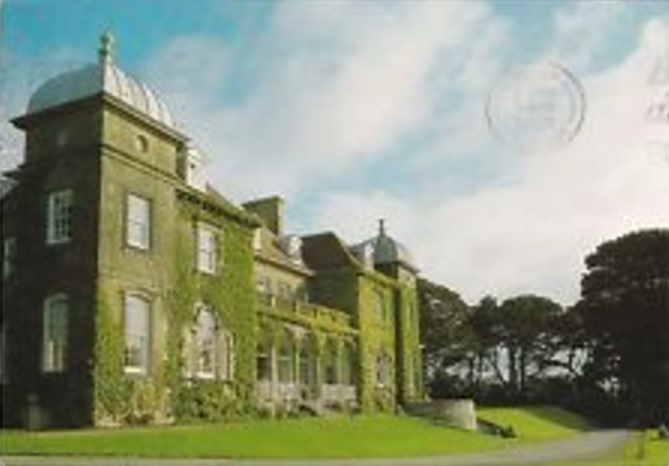 Fowey Hall was deemed surplus to requirement and sold in 1992. 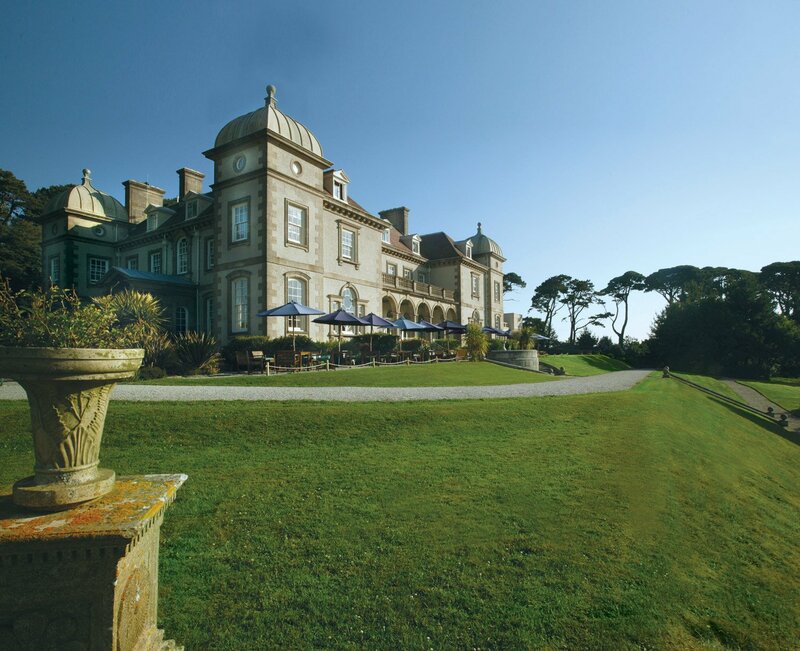 In 1998 Fowey Hall was taken over by Luxury Family Hotels who began refurbishing throughout. Most importantly the library, morning room, drawing room and billiards room were returned to their original uses. The driving force behind the restoration was Nigel Chapman, owner of the hotel group, who later sold the company to Von Essen Hotels in 2006. 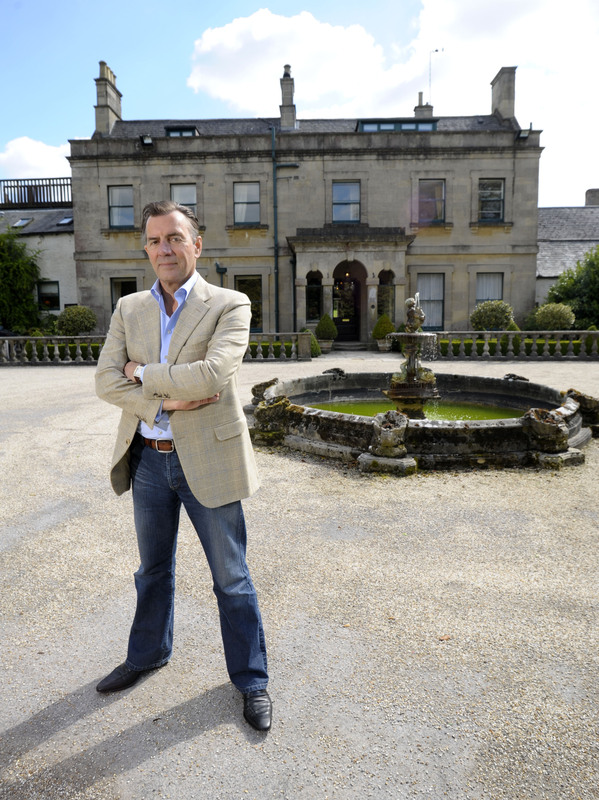 After they went into administration in 2011 he bought back the Luxury Family Hotels chain, including Fowey Hall. 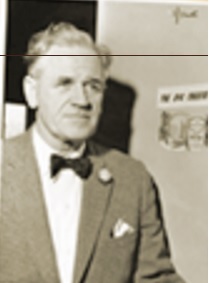 Charles Edwin Bourne Hanson was succeeded by his son Charles John Hanson, 3rd Bt, (1919-1996). He married twice but did not live at the Hall beyond his childhood, spending much of his time in Suffolk where he ran a book shop. However, he did return to Fowey to dedicate a memorial to his grandfather which can be found at the end of St. Catherine’s Parade. The inscription dedicates the lane to the Borough of Fowey in memory of Charles Augustin Hanson, for the use in perpetuity of the people of Fowey as a footpath. 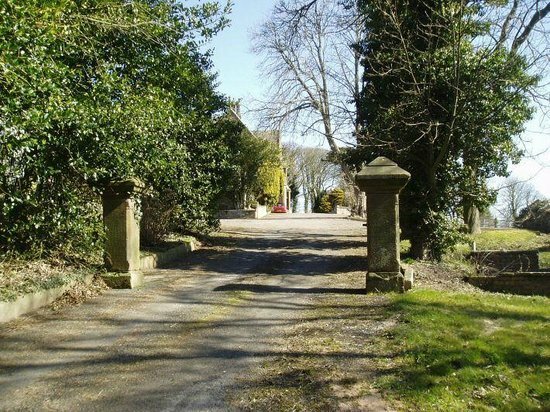 At his request, Charles John Hanson’s ashes were scattered in Fowey cemetery. Upon his death in 1996, the title passed to his son, Charles Rupert Patrick Hanson, 4th Bt, (b.1945) who lives in Brighton. There are many who believe that Fowey Hall was the model for ‘Toad Hall’ in Kenneth Grahame’s. ‘The Wind in the Willows’. Grahame was a frequent visitor to the Hall at the time he was writing letters to his son, which were to be immortalised in his enduring classic, in which the town of Fowey is depicted as ‘The Little Grey Seaport’. 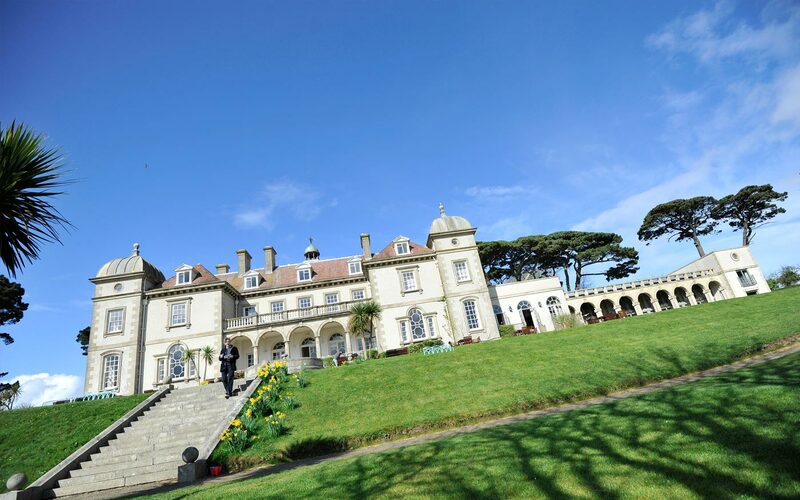 It is likely that he visited Fowey Hall as a guest of his great friend, Sir Arthur Quiller Couch, later famous for his interpretation of The Oxford Book of Verse. Quiller Couch married Charles Hanson’s cousin, Louise Amelia Hicks. The Hicks side of the family was a close-knit group and we can be sure that they were frequently entertained at the Hall. Many details have been obtained from archive editions of the Royal Cornwall Gazette, the Cornishman and the West Briton and Cornwall Advertiser. I am in indebted to the Fowey Hall Hotel who provided vital missing information from documents inherited with the hall, research at the Fowey Library, details provided by the Corporation of London and from Who Was Who. This entry has been updated with new information since original publication. The small boat rocks gently as it tours the landmarks along the River Fowey. Here are buildings of all shapes and sizes. Each property is immersed with history and romance. As the boat heads towards the mouth of the river it cuts it engine and is left to float against the incoming tide. The skipper tells us that the Victorian house nestling above Readymoney Cove is called Port Neptune, built by the Rashleigh family, who lived for most of their time at nearby Menabilly. This is about as much as we learn about the house. It looks splendid, an accumulation of different buildings moulded into one impressive residence that appears to rest on granite buttresses rising from the sea. It is set against a backdrop mature trees that sharpen the features of the house. Before we know it the engines have restarted and we are sailing towards the opposite bank and other treasures yet to be discovered. But as we move away from Point Neptune it calls after you wanting to share some of its secrets. 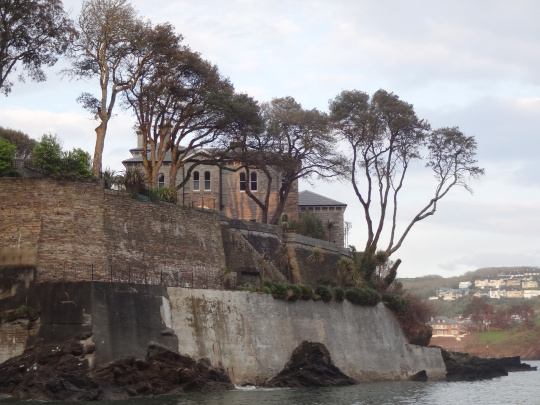 The house is undoubtedly seen at its best from the River Fowey. Here you can appreciate the elegance of its design but a short coastal walk to Readymoney Cove reveals more of the house. Very little has been written about Port Neptune which is surprising considering its dominant position overlooking the open sea. Here the occupants will have been able to watch the boats come and go and witness the growth of Fowey’s maritime history. It was built on the site of an old Napoleonic gun battery that guarded the harbour. The remains are the rising buttresses that remain today. Point Neptune was built in the mid nineteenth century for William Rashleigh of Menabilly. He came from a long line of Rashleighs who originated from Barnstaple across the county border in Devon. 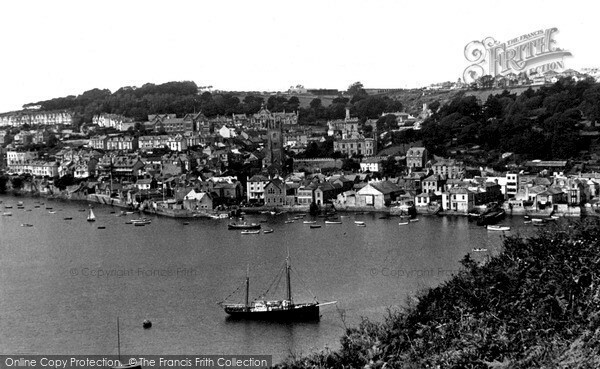 Philip Rashleigh settled in Fowey in the 16th century as a trader. His son’s marriage to Alice Lanyon resulted in the acquisition of Cornish properties and soon became prolific merchants and ship owners. In time they would own property at nearby Menabilly as well as a new townhouse in Fowey (still survived as The Ship Inn). According to research they benefited from the dissolution of the monasteries by scrupulously buying land and re-selling at a profit. By marrying into wealthy Cornish families the Rashleighs became huge landowners with significant influence across the county. Many became MPs and it was Menabilly, on the Gribben Peninsula, that provided the stable family home. 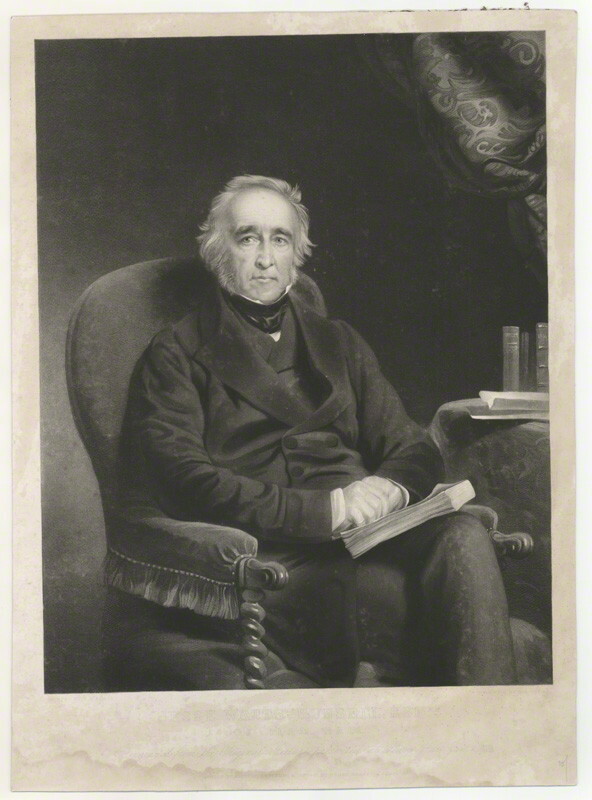 William Rashleigh (1817-1871) was the eldest son of Mr William Rashleigh of Menabilly, by Caroline, the daughter of Sir Henry Hinxman, of Ivy Church, Wiltshire. He was educated for the army and, on reaching 21, travelled throughout Europe, Turkey, the Holy Land, and Egypt, extending his travels to Nubia, along the Nile, at a time when such excursions were few. On his return he was elected as an M.P. for East Cornwall between 1841 and 1847. 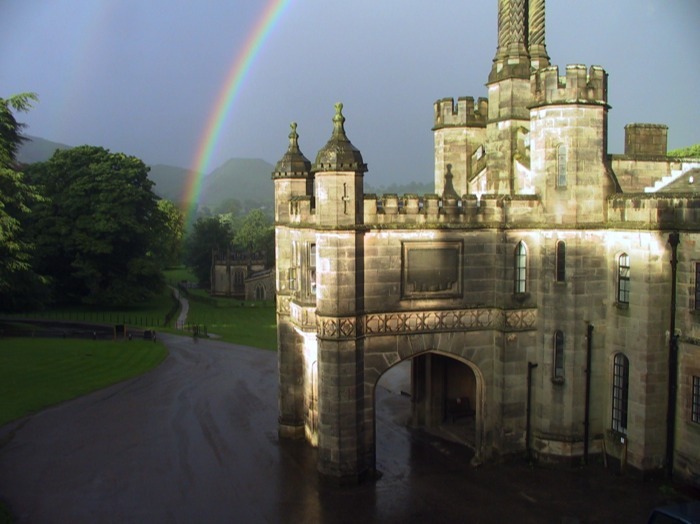 In 1843 he married Catherine Stuart, the eldest daughter of Robert Walter Stuart, the 11th Lord Blantyre of Erskine and Blantyre.. He would become a volunteer with Admiral Plumridge aboard HMS Leopard in the Baltic expedition and, in 1854, found action in that ship during the capture of Bomarsund in the Crimean War. He would serve as a Justice of the Peace, a Deputy Lieutenant for Cornwall and would oblige with the Royal Cornwall Rangers Rifle Militia. When Rashleigh inherited Menabilly in 1855 he was a man of substantial means. However, he was a man of the sea and eventually turned his back on Menabilly, preferring to live by the shoreline. The grand house was left under the stewardship of his brother Jonathan while he looked to build a new home by the sea. His chosen location was the old fortification at the high above the entrance to Readymoney Cove. The cove had once been used as a watering place for shipping in the 18th century. In 1792 pilchard cellars were built (52 feet long and 24 feet wide with walls over 2 feet thick). These were erected on the site of a former gun emplacement. 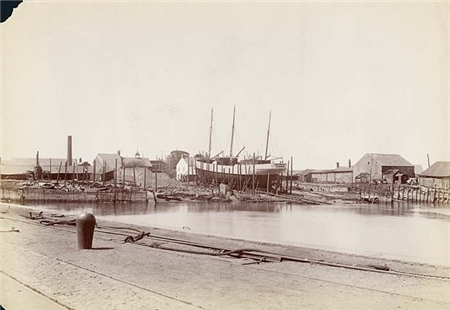 The beach was later used for shipbuilding and ship breaking and, in 1833, the schooner, Catherine, was launched from the beach by the shipbuilder George Nickels. We can only speculate as to what state and condition the old gun battery was in. An old cottage, of painted brick with a low pitched slate roof, existed to the north-east of the site, and this was retained in Rashleigh’s plan for a new marine villa. Work began in the early 1860s and completed by 1862. What emerged was a large L-shaped range to the south west, an entrance front to the west, an extension to the south and a new wing to the south east. The original cottage became part of the servants’ wing. A single-storey hall was built with a drawing room projecting at the southern sea-facing front. 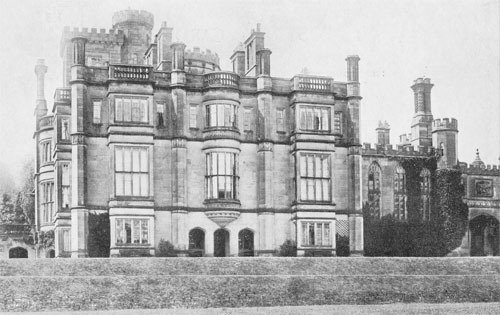 There were extensions to Point Neptune, after Rashleigh’s death, in the late nineteenth century and further alterations during the twentieth century. 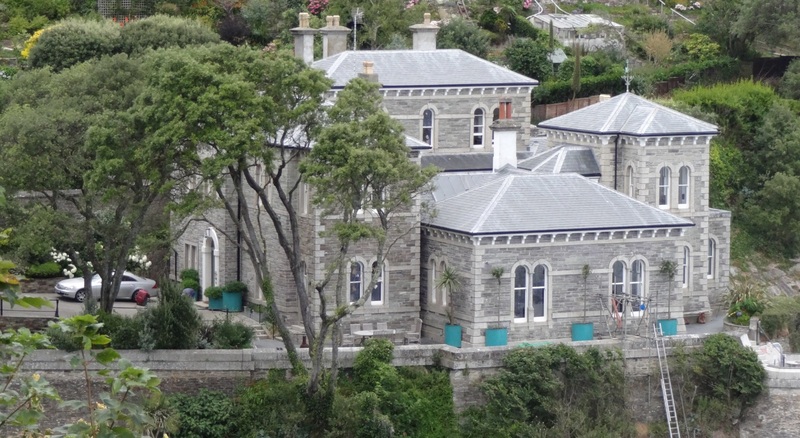 However, what remains is largely Rashleigh’s stone Italianate marine villa, seemingly sitting at different levels, with slate roofs, sash windows and granite dressings, all with an elegant grace that cannot be bettered. 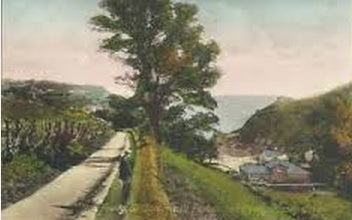 A few weeks later there were major celebrations at the opening of an ornamental carriageway from the Fowey and Tywardreath turnpike road, through his grounds at Lewhire, to the gates of Point Neptune. It was reputed to have cost Rashleigh £500 to build. 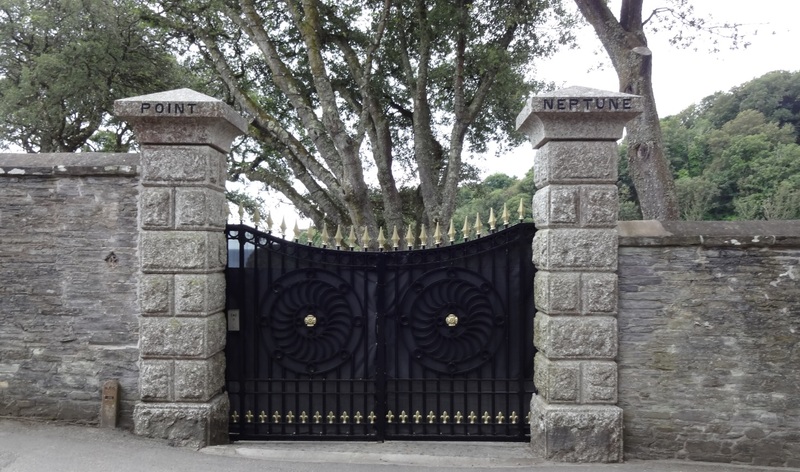 At the entrance to the house were large granite piers where the words ‘Point Neptune’ can still be seen inscribed either side of the large cast iron gates which had originally hung at the four-turnings entrance at Menabilly.³ The stables and carriage house were built below at the head of Readymoney Cove. As is so often the case Rashleigh had little time to enjoy his marine villa. He died on 31 October 1871, aged 54, at St Leonard’s Hill in Windsor. His London address was recorded as 17 Hill Street, off Berkeley Square. Today he lies in a white silk lined coffin at the Rashleigh Mausoleum above Readymoney Cove. He lies alongside his wife, Catherine, who died a year later at Woodhill, Hatfield, in Hertfordshire. The Rashleigh Mausoleum had been built in 1866, cut into the face of the cliff, on the crowning summit known as St Catherine’s Hill. 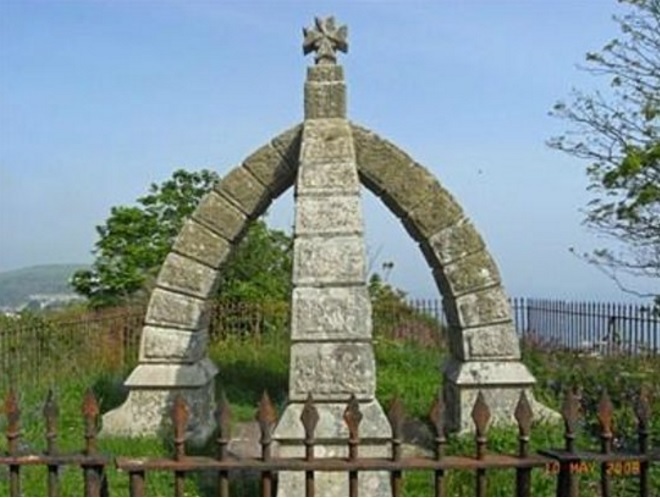 The actual site had been a former gun battery and the mausoleum was excavated into the ground complete with an arched vault made of white fire-bricks. Point Neptune passed to the Rashleigh’s only child, Edith Frances (1849-1905). A wealthy woman, she would marry Sackville George Stopford-Sackville, the MP for Northamptonshire North, in 1875. His work at Northamptonshire County Council and as a Justice of the Peace and Deputy Lieutenant for that county meant he split his time between the ancestral home at Drayton House and London. The 1881 census shows her husband in Northamptonshire while Edith is ensconced at Port Neptune with 8 servants. On her death in 1905 the house would revert to her husband and remain unoccupied. 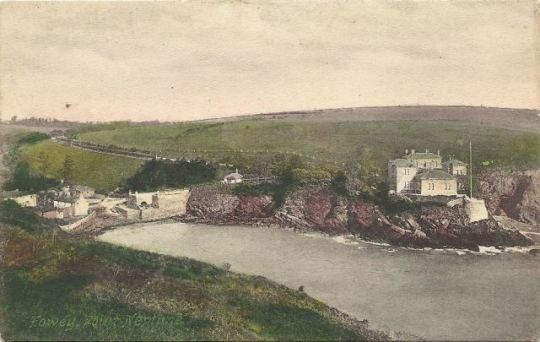 According to writer Hilary Macaskill, ‘a guidebook of 1892 describes Point Neptune as the “beautiful and pleasantly situated marine residence of William Rashleigh esq”, commending its fine view of the harbour, the carriage road leading to it that wound its way alongside the high slate wall, and the footpath at its side. “the use of which Mr Rashleigh and his lady have generously and opportunely presented to the respectable inhabitants of Fowey of all classes”. The next owner of Point Neptune was the Reverend William Eastleigh Henry Cotes (1857-1935). Educated at Cambridge he spent a lifetime in the church serving in Worcester, Kent and London. He rose from modest beginnings and would soon have a house in Portland Place, London, with his wife, Maria Anne, and their son, John Charles Cecil Cotes (1890-1925). In 1911 Cotes employed 7 servants to attend the household. Two of these, the cook and kitchen assistant, were brought up to London from Cornwall. A man of wealth he would use Port Neptune for many years as a summer retreat. His son, John, would eventually move to Readymoney Cove with his wife, Dorothy, and live below Point Neptune in the Beach Cottage. He had served with the Royal Naval Air Service but would die of heart failure following a bout of influenza. His father would outlive him by ten years. The next owner of Point Neptune was John Grenville Fortescue (1896-1969), the son of John Bevill Fortescue of Boconnoc, Lostwithiel and Dropmore, at Burnham in Buckinghamshire. John Grenville Fortescue had been educated at Eton, fought in the First World War, where he was wounded, and gained the rank of Lieutenant in the Reserve of Officers, Coldstream Guards. In 1917 he had married Daphne Marjory Bourke. The land surrounding Point Neptune had also passed into new ownership. 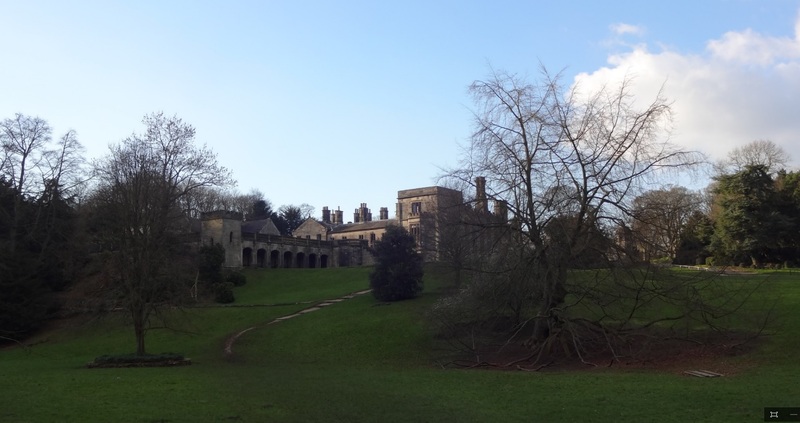 By 1929 the woods had been bought by Mr and Mrs Stenton Covington, popular conservationists, and handed to the National Trust. The old pilchard cellars, later used as a lime kiln, were purchased by Mr Jesse Julian who handed them over to the people of Fowey. These were converted into a shelter with toilets in 1935 and a lawn seating area was built above to celebrate the silver jubilee of King George V.
After Point Neptune was put up for auction in 1931 it fell into the hands of Mrs Hester Parnall (1868-1939), a Cornish lady with a remarkable history. She had been born Hester Hicks, the daughter of Walter Hicks, founder of the St Austell Brewery. She appeared content to live the life of an Edwardian lady and married Thomas Rogers Parnall in 1904. 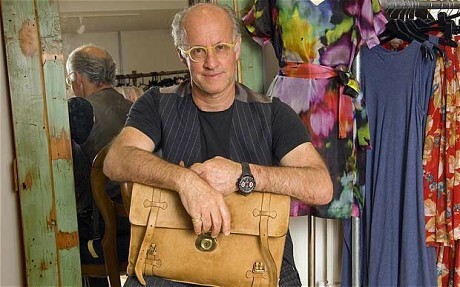 He was the son of Edward Parnall, who founded one of Cornwall’s leading drapery business. 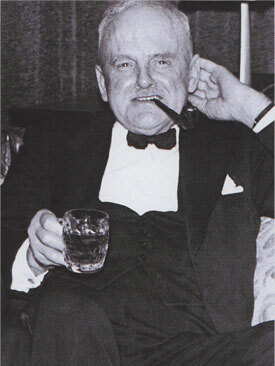 Parnall has been described as a man of leisure although he did serve as a director of the St Austell Gas Company. He was first married to Mary Catherine Parkyn who died in 1897. When Hester became his second wife he was 64-years-old and she a relatively young woman of 36. They would live at Belfield, the family home, in St Austell. 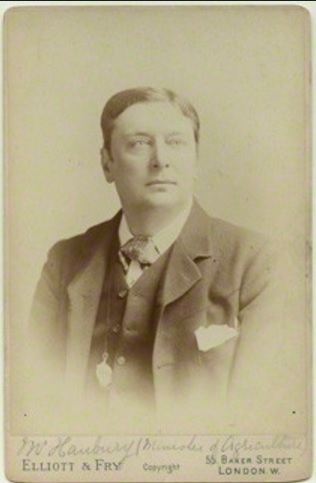 Parnall died in 1915. Walter Hicks recognised a quality in his daughter and exploited this following a family tragedy in 1911. 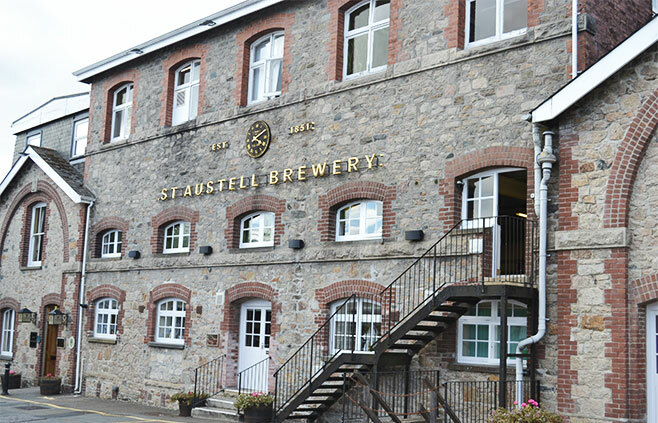 Her brother, Walter Hicks Jr, had been running the St Austell Brewery but was killed in a motorcycle accident at Helston. Hicks turned to Hester and made her a director while teaching her the skills to become Chairman in 1916. Under her management the brewery acquired 79 pubs and hotels and replaced horse-drawn wagons with steam-powered ones. 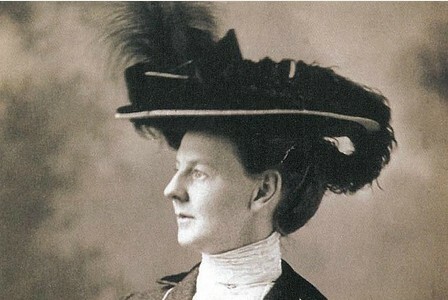 The brewery thrived and she is regarded as one of the first British women to take the helm of a large company. Hester Parnall invested a considerable amount of money at Point Neptune. Between 1936 and 1939 she modernised and redecorated the house and lowered the lounge windows to provide better views of the sea. She was no doubt preparing the house for her retirement. Hester handed over control of the St Austell Brewery to Egbert Barnes in 1939, only three weeks before her sudden death. Point Neptune was immediately offered for sale with the contents offered for auction in 700 lots. With war looming it was not inconceivable that buyers were unwilling to invest in property. 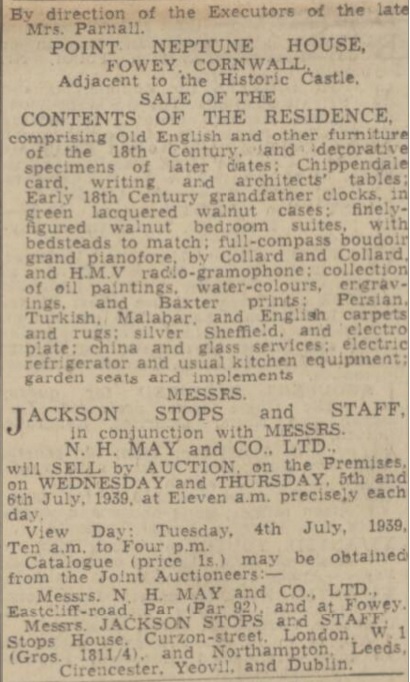 The house didn’t sell and by August 1939 it was offered for let. During World War Two it is likely that Point Neptune remained largely unoccupied. At the end of the war it was once again offered for sale. By now the former stables and carriage house had been converted into Point Neptune Cottage but known locally as Readymoney Cottage. It had been author Daphne Du Maurier’s home between 1942 and 1943 before turning her attentions to the Rashleigh’s Menabilly. In 1949 St Catherine’s Parade was leased to Fowey Borough Council for 50 years and gifted to the Borough of St Austell and Fowey in 1970. 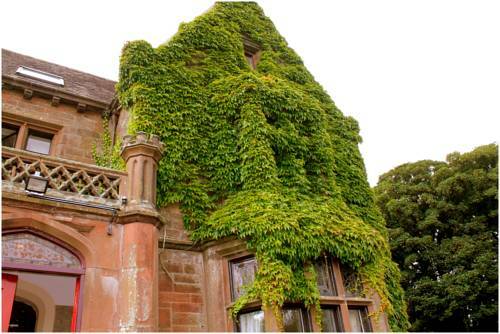 For many years Point Neptune was the home to Mr and Mrs Hughen Welch. He had been a chartered accountant in South Africa and Rhodesia for 60 years before retiring to Cornwall in 1983. After this time the marine villa was converted into luxury holiday flats with the Welch family living on the ground floor. It was awarded Grade II listing in 2001. He describes Point Neptune as “a wonderful place to live” but chose to sell it in 2006. 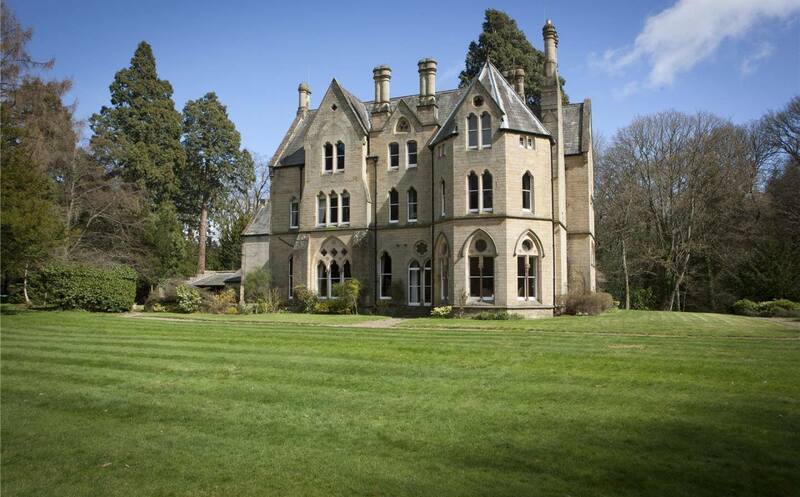 It was marketed at £2.8 million and bought by comedian Dawn French and her then-husband Lenny Henry. 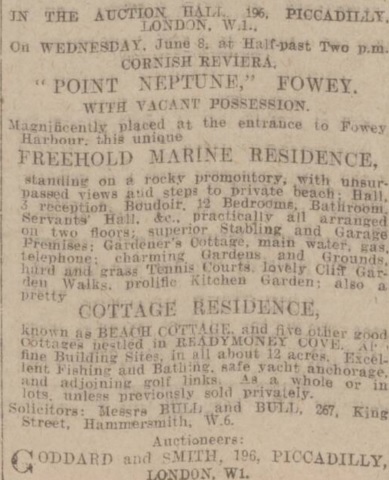 It is derisive that, at the time of the sale, Point Neptune was described as being ‘”‘next door to the house where Daphne Du Maurier once lived”. Time has somehow crafted Readymoney Cottage into being more famous than the estate house to which it once belonged. The house has been tastefully renovated and, despite an amicable split with Lenny Henry in 2010, it continues to be an attractive family home for French and her second husband, Mark Bignell. It is here that French has written her memoir, Dear Fatty (2009), as well as her novels, A Tiny Bit Marvellous (2011), Oh Dear Silvia (2013) and According to Yes (2015). With a roguish twist of fate Point Neptune has now become the home of a writer maintaining the literary romance that Cornwall is celebrated for. St Catherine’s Parade survives as a public pathway but shows little evidence of its past glory. It is now a public footpath of compact earth, gravel and tarmac, bordered by advancing hedgerow and growth. Banks and walls remain but survive in poor condition. A footpath once ran down the side of the carriageway but this has all but disappeared with the advance of nature. At the seaward end old holm oaks still survive but there is little evidence that this was once the grand approach to Port Neptune.